This blog is written weekly by Dock David Treece, a registered investment advisor with Treece Investment Advisory Corp. It is meant to share insight of investment professionals, including Dock David and his father, Dock, and brother, Ben, with the public at large. The hope is that the knowledge shared will help individuals to better navigate the investment world. Lately gold has taken a tumble as the broader market and the economy begin to show faint signs of life. Hopefully some investors were able to sidestep this move; they were certainly warned. Readers look no further than last week, when we wrote that gold’s price was inflated and would likely correct. We wrote then that a growing number investors were unaware of the dynamics of investing in gold, and that they needed to be sure they committed enough time to understanding the way commodities work. Another warning we issued over a year ago (Buying is Golden) was recently picked up in Businessweek’s cover story “Amber Waves of Pain” (Robison, Loder and Bjerga), namely the pitfalls of ETFs, particularly those utilizing leverage or focused on commodities. The problem with ETFs is that very few investors or their advisors know exactly what they are, much less how they work. The Businessweek article hit the nail on the head when they said the reason for creating such ETFs was to open commodities, which have generally been restricted to futures traders, to a much larger sales force, as funds were made available through any broker who trades in stocks. Businessweek also revealed that through ETFs, “Wall Street banks are transferring wealth from their clients to their trading desks.” Moreover, traders with expertise in the futures market have gone on record as saying that these products have allowed them to “make a living off the dumb money,” namely investors (Emil van Essen, Amber Waves of Pain). The lesson here is that ETFs and other complex investment products, including derivatives of all types, should raise red flags for investors. If these products are being suggested as investment opportunities, investors need to make sure that their advisors know what it is they are pushing, and how these products react to changing market conditions. In addition to the recent Businessweek article, the market has been inundated lately with articles hinting at improvement in the US economy, though largely without additional employment. While the economy has been slowing regaining its footing for months, we have lately seen numerous instances of increases in corporate spending that lead us to believe that the economy will continue to improve. However, we still feel that this recovery will be mostly jobless, at least for awhile, due in part to the extension of unemployment benefits by the powers that be in Washington. While the economy should continue to recover – barring any unforeseen shocks to the market – employment won’t like begin to recover substantially until into 2011. With election season approaching, it seems highly likely at this point that, come November, the Democrats will at least lose the House of Representatives, if not both houses of Congress. Political gridlock will likely result, as all spending bills must originate in the House. This administration’s ability to spend will be ground to a halt, and we won’t likely see any significant legislation from Capitol Hill for the remainder of Obama’s term. However, we see this as a positive for the economy and financial markets. If the last several years have taught us anything, it’s that business hates uncertainty. In the event of gridlock in Washington, businesses will be able to rest easy that no major surprises will negatively impact their bottom lines. Our hope is that the removal of regulatory roadblocks from the private sector will create sufficient incentive for companies to continue spending and expanding, which should bring this economy roaring back to life. Dock David Treece is a stockbroker licensed with FINRA. He works for Treece Financial Services Corp.(http://www.TreeceInvestments.com/) and also serves as editor of the financial news site GreenFaucet.com and as a business commentator for the Toledo Free Press. 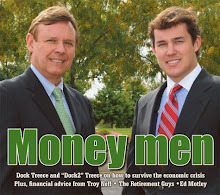 While Dock David's typical content includes commentary on recent economic or political events and trends within the global financial markets, those pieces in the "Dollars & Cents" category have been developed for the Toledo Free Press STAR edition for younger investors. The information contained in these posts is the express opinion of Dock David Treece and should not be used without outside verification, it should not be construed as investment advice. Dock David Treece is a registered securities representative with FINRA, a registered investment advisor, a registered securities principal, and a financial operations principal. He works with Treece Financial Services Corp and Treece Investment Advisory Corp.
"Dock2" graduated from the University of Miami (FL) with a Bachelor's of Business Administration and a focus in Finance. He has worked in the investment business under the tutelage of his father since an early age, and also worked for several other financial firms including Franklin Templeton Investments and John Hancock Financial Network.